She’s been this way for a few weeks now. At first, I thought she was just enjoying lingering in the nesting boxes perched upon the bounty of beautiful colorful orbs each day. Yet soon enough it was clear. She had morphed into a dinosaur-like shrieking pancake that simply did not want me lifting her off the nesting box. She was definitely broody. So each day it has gone on, I pry her from the box, give her a good scratch, a wing rub and send her on her way to poo, eat and drink. However, what happened the other day left me speechless. 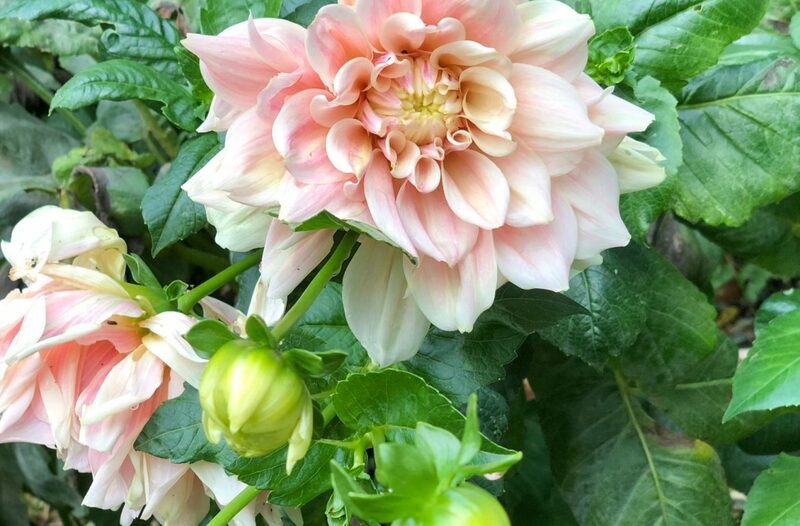 We had a very busy week here at Tilly’s Nest. Most of my days were spent down in the schoolyard organic garden getting our volunteers trained. This week we harvested beets, mixed greens and Swiss chard! We also built a compost bin with left over lumber and hardware cloth. It was great fun. Back at home, the girls had their first real run-in with mites. I think, for now, we were able to be proactive in our treatment of the mites. With numerous defense and treatment options, I think that I was able to make the girls more comfortable and more likely to lay their eggs. Thank goodness, I had read up on those little critters this past winter. The girls also got a treat of beet greens today, confused at first thinking it was lettuce, they were a bit surprised when they took a bite. However, it took no time for them to gobble up every last bit. I even took a large handful of the greens and compacted it into a ball and placed it into the hanging treat ball. Tilly loves to play pinata! Finally, we had our very first giveaway this week. The last day to enter is today and tomorrow, I will announce who is going home with the Eggcellent Sprout and Grass kit from Treats for Chickens. You can still enter up until midnight tonight. Good Luck! 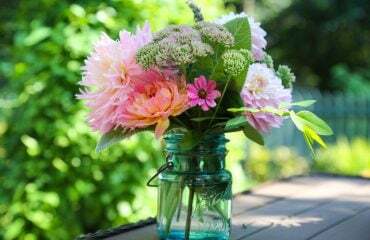 This post is linked up to Deborah Jean’s Dandelion House Farm Girl Friday Blog Hop. Last night, Dolly slept with the large flock out in the coop. She has decided to return home with her older flock now that her chicks are 4 weeks old. It took her a few days to make her decision. Dolly and I worked together to help her transition easier. Over the past few days, she spent more and more time out with her old family and less and less time with the chicks. Today, she no longer calls for her chicks when in the large coop area. 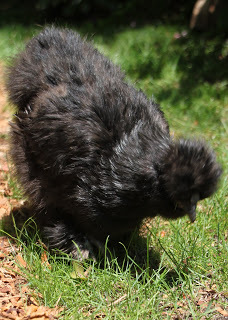 She also no longer cares to find me to help her return to the brooder and her chicks. She has made her decision. I do have to say that keeping the chicks is a bit easier for me without Dolly in the brooder with them. 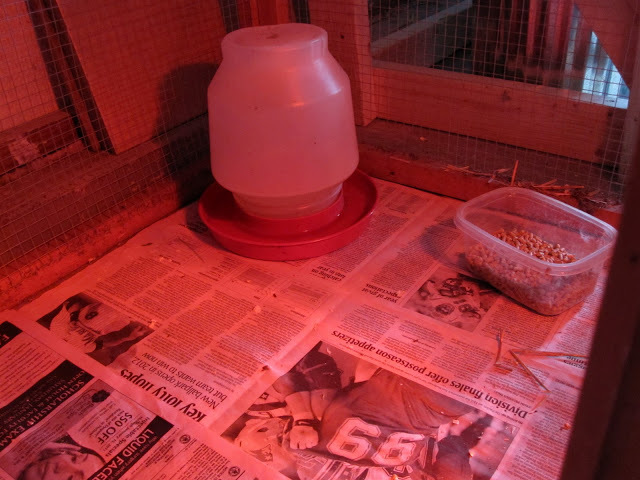 I find that I do not have to clean out the waterer and feed dish as frequently. 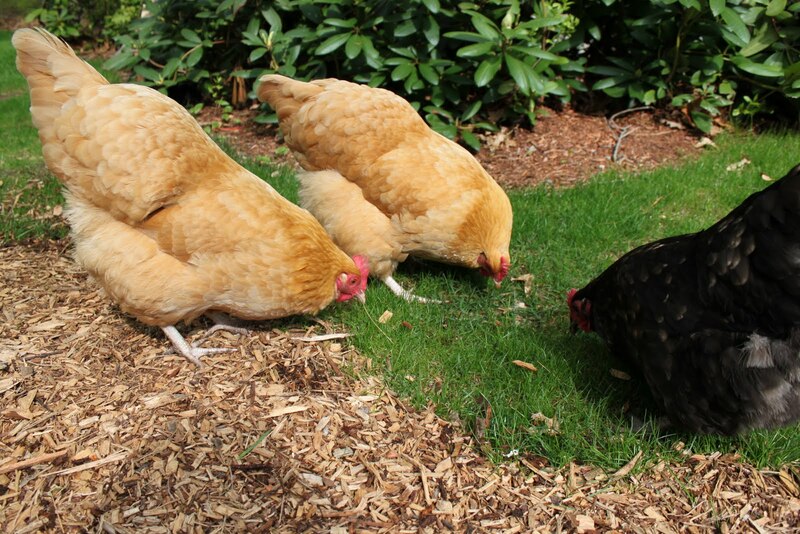 Perhaps, it is because there is not an over sized chicken in the brooder scratching pine shavings everywhere. The chicks are also not as afraid of my hand. Still timid, I can reach in and not have panic ensue. I also do not have Dolly pecking at my hand and warning her babies of my hand’s arrival. Last night, the babies slept well. They did not look for Dolly to help them fall asleep as they did two nights ago. Instead, they nestled together,creating a downy patchwork quilt amongst the brooder floor. In the middle of it all, was Dottie Speckles, our 4 day old chick, laying her head on the wing of her new found sibling, our brooder’s alpha rooster! Finally, a small pecking order is starting to develop. At the helm is Dottie Speckles! She runs the show. I find it so funny. 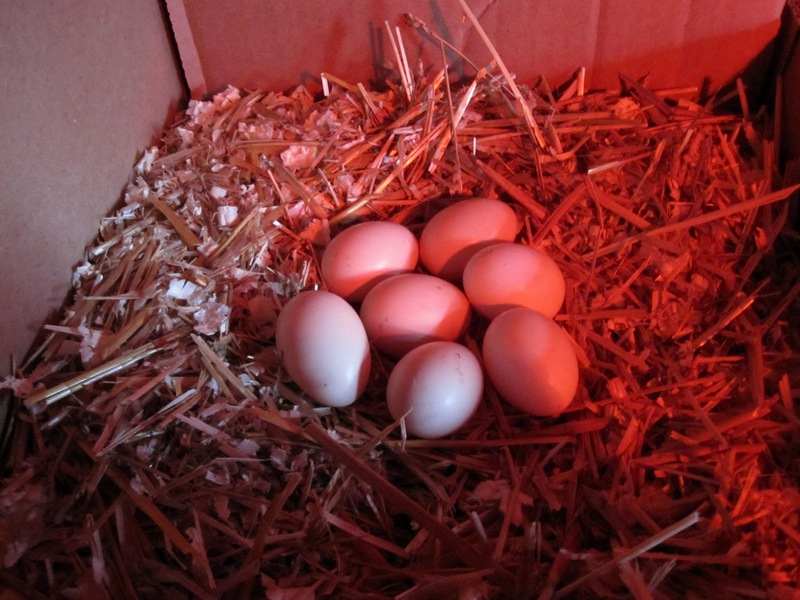 Everyone in the brooder follows her lead. She holds her head high and carries herself as though she is very important. When she drinks and eats, everyone follows her lead. She is a hot ticket. I also find that the roosters are starting to have mini-battles to determine the alpha male. I laugh, as it reminds me of a real western showdown. Everyone is growing up so quickly. I am glad that Dolly is happy to be with her old family and in her original home where she can relax, visit and scratch amongst familiar surroundings in the run. There truly is no place like home; even for chickens. 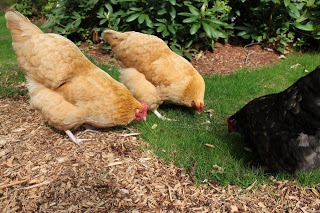 Meanwhile…three other hens are broody in the coop! 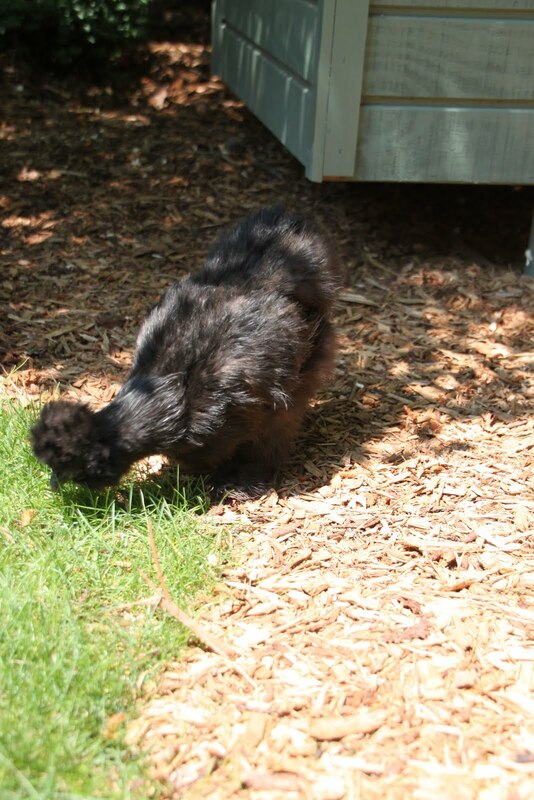 Left undisturbed, with no other members of her chicken family, Dolly has gotten down to business! She is vigilantly sitting on all of the eggs. After yesterday’s concerns about eggs 1,5, and 6, I added two freshly laid Silkie eggs to her clutch. Her total now comes to 9. This should be sufficient to see some little chicks in 2 1/2 weeks. Most of yesterday she remained in her deep zombielike trance. She is drinking water but I am not too sure about the amount of food she is eating. I can tell you, she is dedicated. I have tried to tempt her off the nest with treats and fresh greens. She is not interested. Out in the main coop, the rest of the flock does not seem to notice that she is gone. I am concerned that when I do bring Dolly back, they will not remember her. She was in the middle of the pecking order. 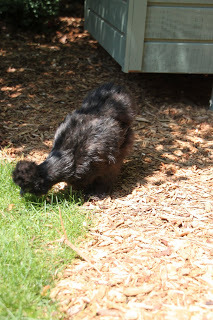 In her absence, the chickens continue to scratch and find goodies. They are happy to sunbathe and take dust baths. Chocolate continues to share his discoveries with his girls. He even alerts them to potential danger from a threatening looking Chickadee. As you can see, it’s business as usual at Tilly’s Nest. Life is good. I have been quickly catching up, reading as much as I can about broody hens and hatching eggs. My learning curve has been on an upward trajectory! 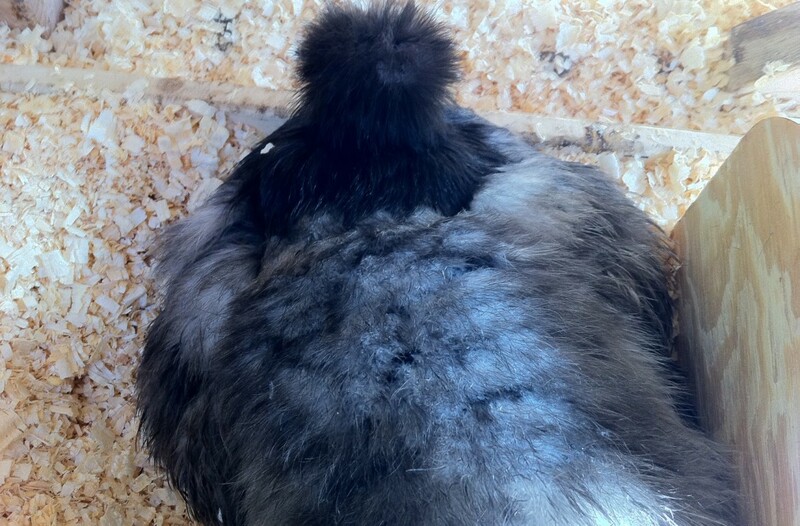 Most resources suggest separating the broody hen from the rest of the flock. Some jealous hens can become saboteurs or even have nesting envy, only to kick the broody hen off the nest at day 20 and reap the benefits of motherhood. In turn, the broody hen who sat all those long days is robbed of her children. I was still in the process of making my decision whether to leave Dolly with the flock or not. So far, for the most part, they have left her be. I did however, find Tilly’s egg underneath her yesterday. This morning was a different story, perhaps because I was later than my typically punctual arrival. I let the flock out, added fresh water, scratch and then ventured over to visit Dolly. She was sitting on her nest but what I saw I could not believe. Egg number one was rolled into the center of the coop. 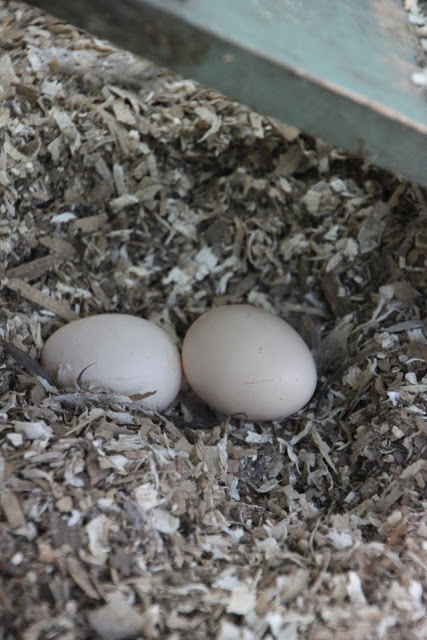 Eggs 5 and 6 were found in the nesting box next to Dolly. Eggs 5 and 6 were still semi-warm but Egg number 1 was chilly. This was not good. As quickly as I could, I gathered the three eggs and returned them under Dolly. 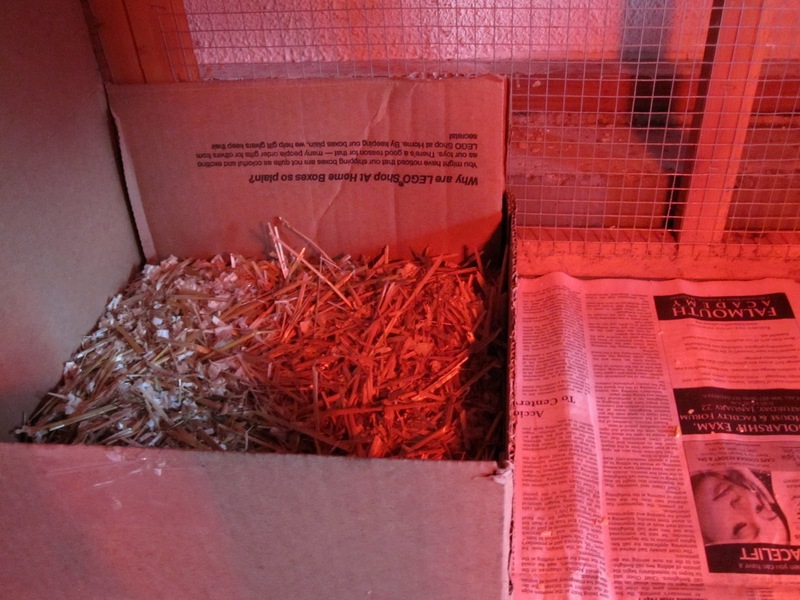 I next went to the garage and began to set up my temporary brooder. I gathered an old shipping box, an extra waterer and an old Tupperware container for food. 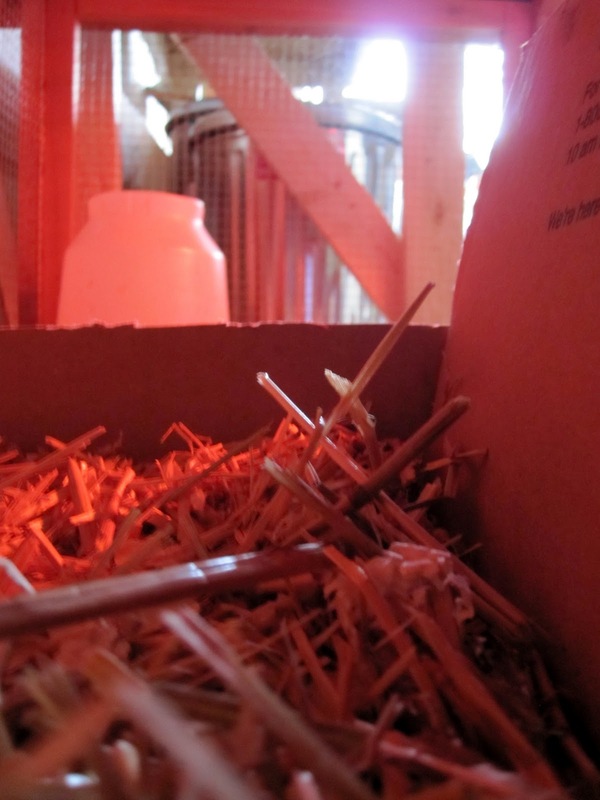 I created a nest with shavings and straw. 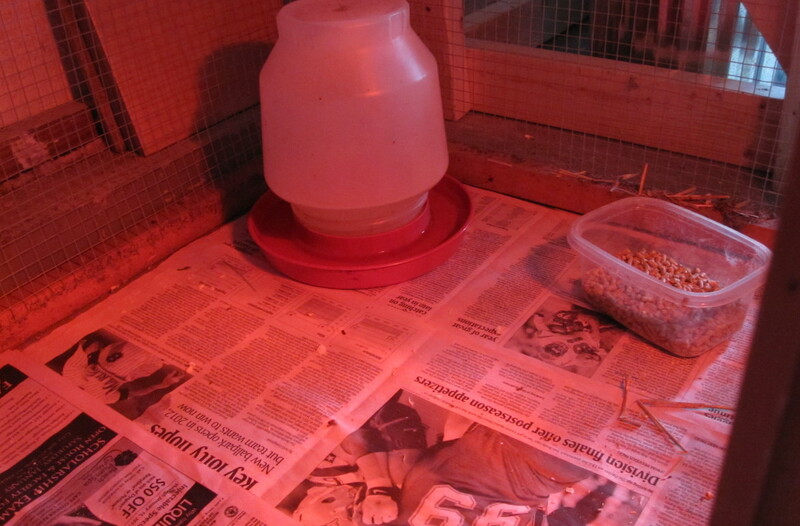 As I was setting up this brooder, I could hear squabbles from the coop. I went over and saw Tilly sitting in Dolly’s nesting box. I looked in the run. I could not see Dolly. Dolly must still be in the same box as Tilly. It seemed like forever, but Tilly finally laid her egg. My window of opportunity had arrived. Quickly, I scooped up all of the eggs. I placed them in the makeshift nest. Next, I ran to the coop and grabbed Dolly. I placed her in the new brooder. Dolly was not happy about leaving the coop. I think she thought that I was taking her from her eggs. Little did she know, I was taking her to their new location. 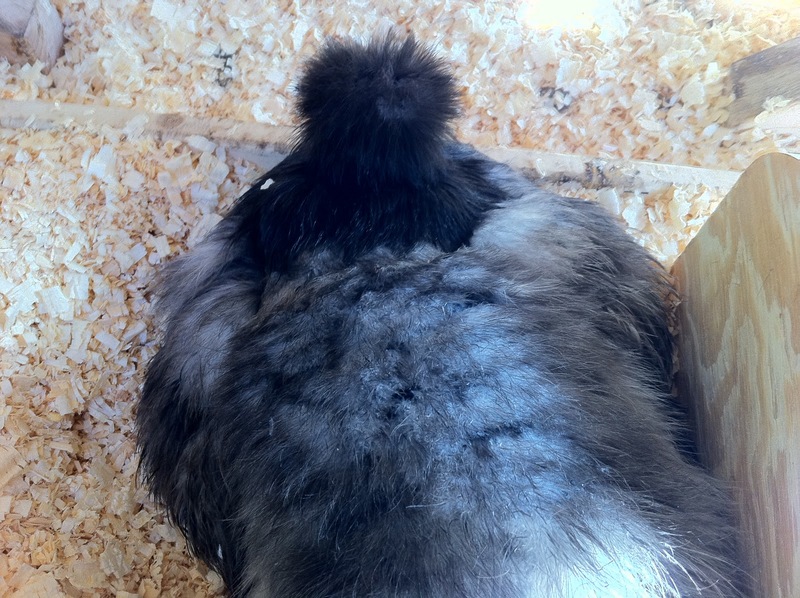 I placed her in the brooder. She was nervous. I showed her the eggs. 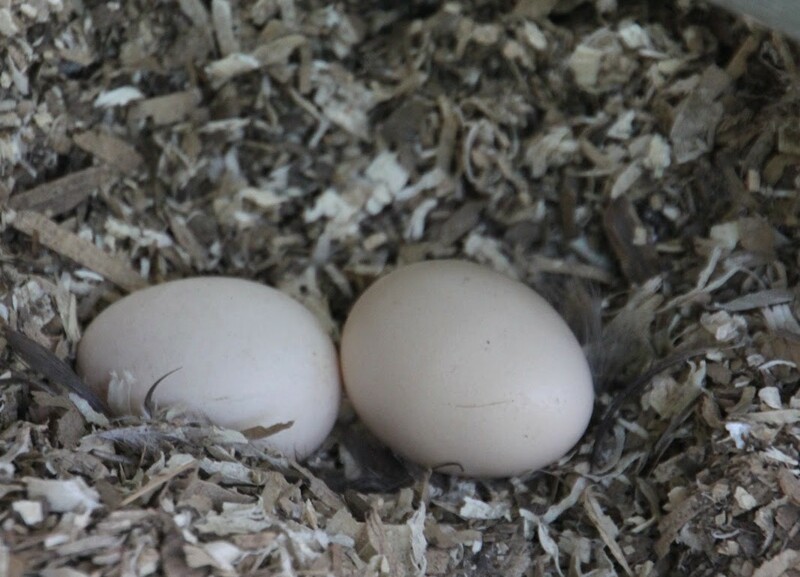 She stood in the nest, rolled two eggs with her beak and got out. She looked around and was talking. Taken back by confusion and utter nervousness, Dolly was apprehensive of her new surroundings. I decided to scatter some scratch on the ground. She started to eat the scratch. When she was done. I showed her the eggs again. 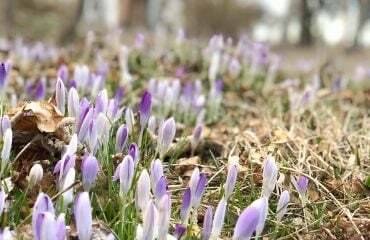 Time was marching on. 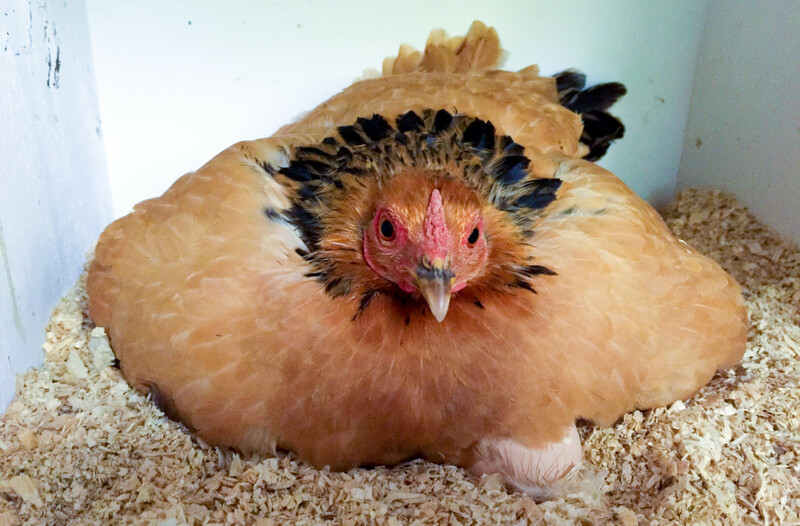 The eggs were getting cold and Dolly was showing no signs of broodiness! I showed her the eggs a few more time. Each time, she panicked and hopped off the nest. Thoughts entered my mind that I was going to have to abandon any attempts of Dolly and parenthood. Finally, just as I had my doubts, I showed her the eggs once more. She squatted on them. Then gently rolled each egg on the outer cusps into the center, puffed out her body and wings, then settled down on the eggs. Thank goodness! As she sat, I praised her. I then noticed that her comb was bleeding. My best guess is that it was from her earlier squabble with Tilly. I think I made the right decision. I just hope I was not too late for her eggs. Dolly has been sitting on eggs for 3days. She seems to be a great broody hen! As of this morning, she has a total of 5. Today will be my last opportunity to place anymore eggs underneath her. You see, the mother hen will sit on the nest for 2-3 days after her first chick hatches. This is to see if any other eggs in the clutch will hatch. However, after about 3 days, she will abandon any unhatched eggs and begin to raise her brood. I have been collecting Silkie eggs from the nesting boxes to place under Dolly. If they are still warm when I pick them up, I quickly number them with a pencil and place them under Dolly. She seems so pleased when I add another to her growing collection! I am also amazed at her instinct. Yesterday, while peeking through the window, I witnessed her turning the eggs. With the most amazing grace and gentle touch, she inspected each egg and rolled it according to her liking. Wow! How in the world did she know how to do that? She seems to leave the nest a couple of times a day, but it is only for fleeting moments at a time. I have placed fresh water with vitamins and electrolytes near her as well as food. In a few days, I will attempt to candle the eggs to insure viability. I have never done that, so it will require some research. I too am learning all about this fascinating process. If all goes according to plan, we might just have some chicks in time for Easter. The whole family is rooting for Team Dolly! I did everything I could. I cleaned out the coop. I continue to empty the eggs from the nesting boxes three times a day. I bring out all sorts of delicious treats as distractions. I visit the flock multiple times daily. But I spoke to soon. Dolly is once again broody. She is starting to pull out her chest feathers, growl and sit on an empty nest all day long. I suppose there is something to be said about a Mother’s instinct. 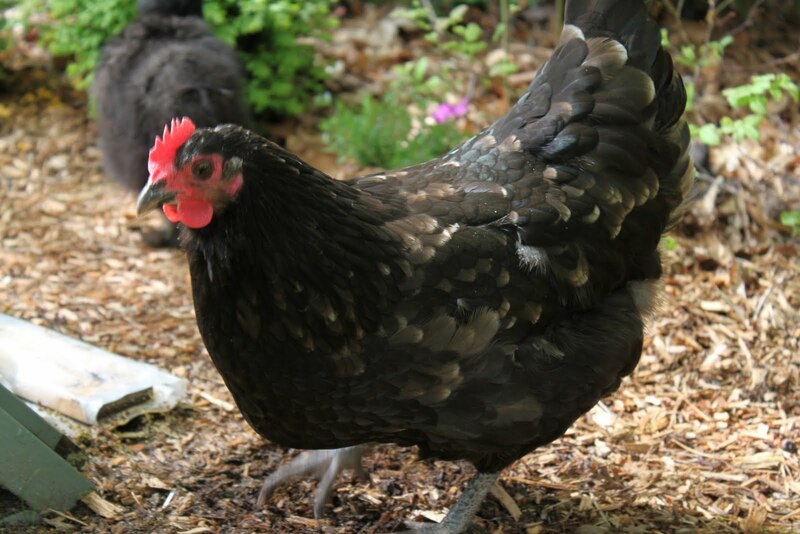 I find it interesting that some breeds tend to be broodier than others. I know that Silkies tend to be broody. I wonder if there are hens that go broody more often than others? Like people, do some hens just make better mothers? Well, if that is the case, I guess I should feel fortunate that I have Dolly in the flock. 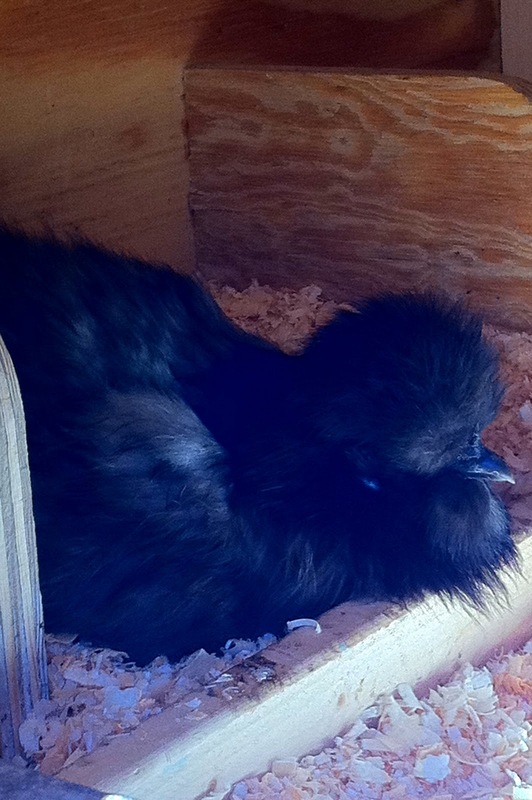 I hope she decides to go broody this Spring. It will be a great experiment for our family to see if she can actually hatch some eggs. Springtime chicks would be wonderful. In the meantime, Oyster Cracker was coughing and sneezing this morning. She is still eating and drinking and her comb is red. I do not want to take a chicken to the vet this week. I hope that this too shall pass. I can’t help but worry about these chickens sometimes. I think that there is the distinct possibility that Dolly just might be going broody again. 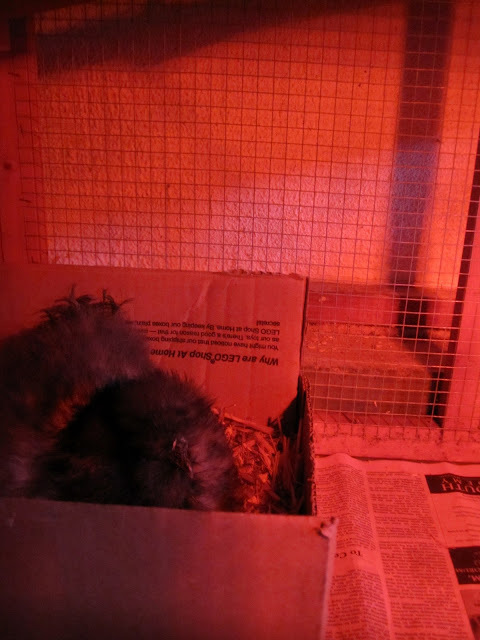 Last night about half an hour before I locked them in for the night, Dolly was sitting in the nesting box. Once again, I could pet her. I reached underneath and found a warm egg snuggled into her chest feathers. I removed the egg. She did not leave the box. If she is broody again, I can not believe it! She has only been out of her last broody state for 2 weeks! I thought about her all evening. This morning, I went out and they all came out together. Dolly was outside enjoying fresh water and scratch. Just now, I went to check if she was in the box. She was outside in the run. I found an egg. Tilly laid an egg and somehow it ended up outside the box. Tilly never lays outside the box. Last time Dolly was broody, I found her stealing other chickens’ eggs and rolling them into her box. She was so desperate that she tried to sit on everyone’s eggs. What is going on in there? I think that I am going to clean the coop today; maybe that will throw the flock off and distract them. We might have some adverse weather tomorrow. I just hope the forecast doesn’t call for rain and snow with a chance of broodiness.